Will and Kate's World: First Day of School 2011! Well…I just about had a nervous breakdown last night after going through all of the paperwork for third grade and realizing that the years will only be hard from now on and there will be no more easy years. But after a good nights sleep, LOTS of prayer, and encouragement from my FB friends, I think I am over it! We woke up early this morning and the girls were ready in record time. I tried to enjoy it since this will probably be the only day this year that that happens. I’ll take what I can get! 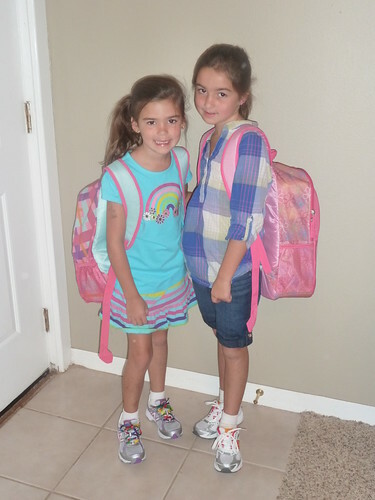 Here are the girls all ready for school! 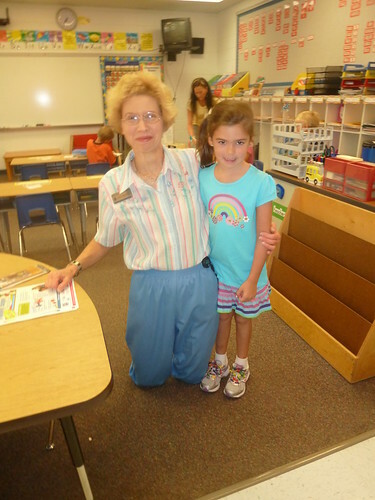 Here is Anna with her teacher Mrs. Hendricks. Everyone says that she is a great teacher, so we are excited! She was a little upset about a little boy (who apparently is a problem child) being in her class. She doesn’t like anyone to draw attention to her or get her in trouble. Neither of her ‘good’ friends are in her class but, she does have some kids in there that she knows so please pray that she makes new friends and has a productive year. 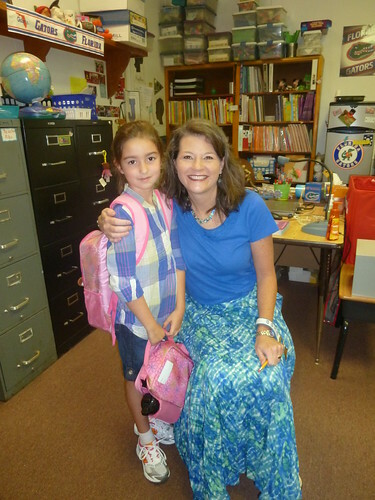 Isabelle and her teacher Mrs. Free. This is who she wanted and I think this will be a GREAT year for Isabelle even though it will be tough. Mrs. Free was our school’s teacher of the year last year. I have high hopes! The girls put one of their little backpacks on Luke this morning and he followed them around all morning with ‘his’ Dora backpack on thinking he was going to school with them. He tried to run into all of the pictures that they were taking so we had to take one of him with ‘his’ backpack. Now we just need to pray that he is not clingy and whiny all day every day since the girls are not here. He has gotten very used to them being at home. Today I am praying for and thinking about all of our other friends and family that are starting school today. I am especially praying for our friend Amanda and all of the things that she is going through this morning with two (I think) girls starting school today, one sweet special needs baby boy, and a baby on the way. So I just wanted to end this post by asking for a little extra prayers for all of the kids and families that are starting school today.